A viral tweet from a millennial woman has sparked a debate about, of all things, bed linens. Millennials* have been accused of killing off all kinds of things, including doorbells (because texting) and beer (in favor of wine and weed). 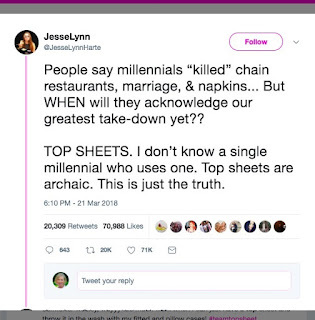 Tweeter JesseLynn, a recent college grad has thrown down the gauntlet, laying claim to her generation’s cultural omnipotence, by declaring her cohort has killed off the top sheet. 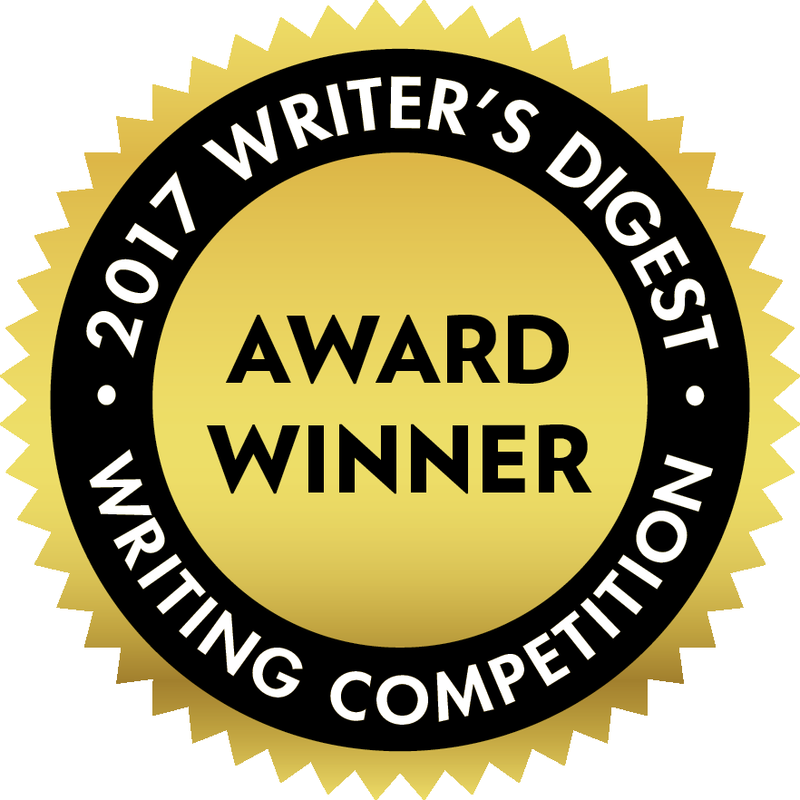 Yes, that smooth, flat rectangle of Egyptian cotton or percale that goes between you and your blanket or comforter has been deemed superfluous. Maybe it’s a decent life hack. Millennials are a long way from menopause so they’re not likely to wake up in limp, damp sheets courtesy of nighttime hot flashes. 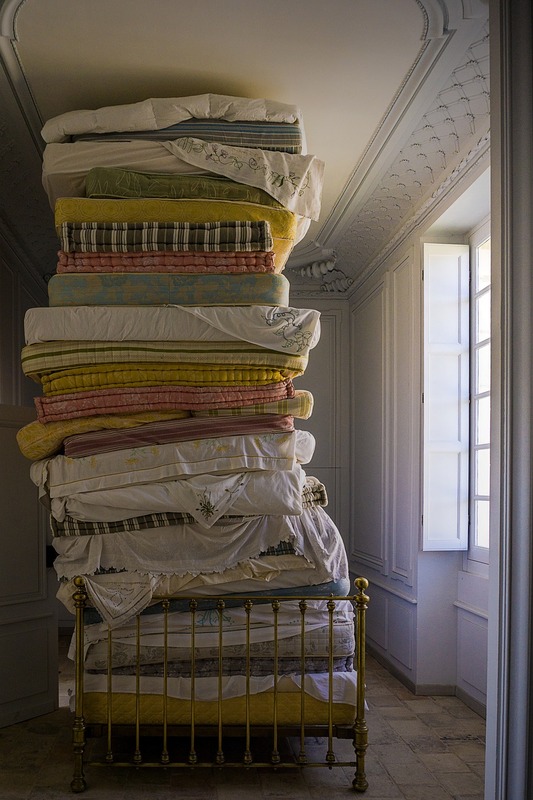 Granted, it’s easier to make the bed if all you have to do is pull up a comforter instead of smoothing, centering and tugging your sheets into quarter-bouncing submission. Would it make my life easier? Or would I be wrestling my sweaty, bulky comforter into the wash every week? 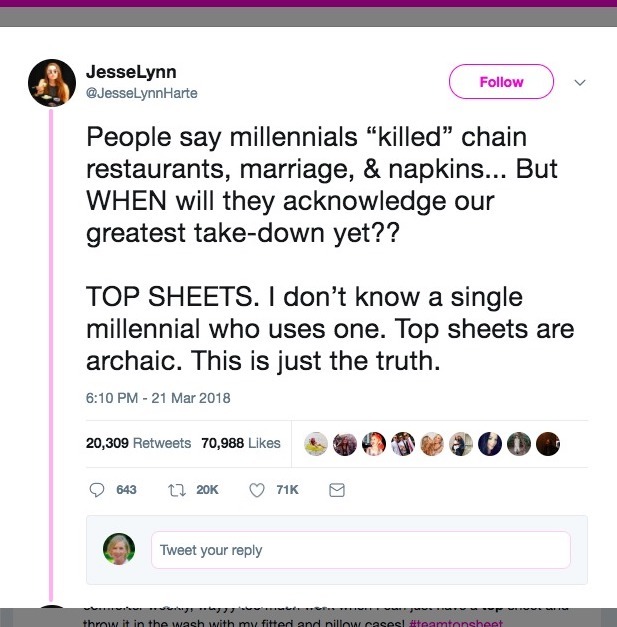 When I stumbled across the shocking top sheet revelation on Twitter, I wondered, briefly, about my own 20-something kids. Have they, too, abandoned traditional bed making and hospital corners? Does anything come between them and their duvets? But then I reminded myself that what goes on their boudoirs is no longer any of my business. 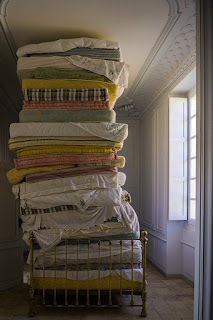 I was sure those New York hotel maids had made a mistake and I dialed up housekeeping to remake our bed with the missing piece of linen. Now, I’m blushing at the faux pas. How unenlightened of us to not know this was A Thing. 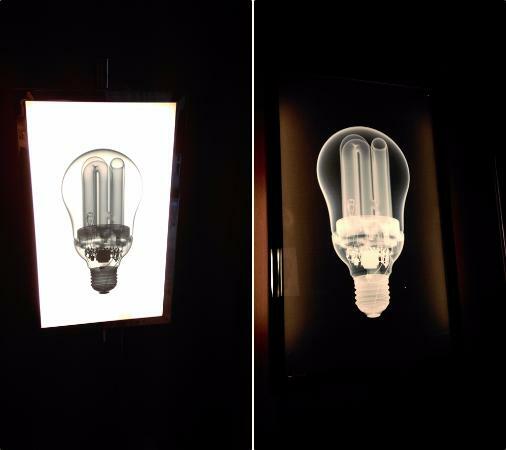 And speaking of enlightened… the light facsimiles on the bedside tables in that hotel room featured X-ray film of a bulb and cast off a dim glow so stingy that no Baby Boomer could possibly read by them, bifocals or not. And I’m pretty sure this particular hotel didn’t give a sheet about that either. *Pew Research defines millennials as people born between 1981 and 1996.